I'm preaching today at a local nursing home on Jonah chapter 2 (I also preached this message last Sunday night at my local church). Here's part one of this message, I hope to post part 2 next week. Read Jonah 2:2. The Lord heard Jonah’s prayer from the belly of the great fish under the sea. Jonah thought he was getting away from the Lord. (cf. 1:3). Imagine his surprise to find out God could hear him from inside the fish? I wonder how many times we end up in the belly of a fish, a bad place, but a place that has potential to become a house of prayer if we let it but we don’t realize it? Our house of prayer could be a hospital bed. A wheel chair. An empty room. A waiting room. A long car ride alone. Jonah’s situation, being in the fish’s belly, teaches us that all of these places can become a house of prayer if we let them. Are we willing to let them? The secret is that no matter where we are, our prayers reach God’s ears. I’m reminded of the children of Israel and their captivity in slavery to the Egyptians. In Exodus 2:23-25 it talks about them praying and God hearing their prayers. The next chapter in Exodus is about God calling Moses from the burning bush. God hears our prayers. There are Christians right now, around the world, which are in dungeons, holes in the ground, and prisons, whose prayers are being heard by God. Some places (like my church’s prayer room) can be better suited for prayer, but the truth of the matter is God can hear us anywhere. 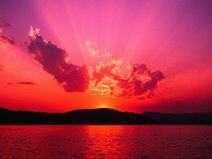 The Early Christians (Acts 2:42d) understood you could be heard by God anywhere. They were no doubt familiar with the story of Israel in captivity and how God heard His people's prayers and the story of Jonah's prayer from inside the fish. I love the story in Acts 16. Re-cap some of the events leading up to this story. Paul and Silas are thrown into the inner cell of prison and what do we find them doing in verse 25? Praying. We know God heard their prayers because there was an earthquake and a jailbreak. God hears us anywhere we are. Do not forget that. If you do, go and read Jonah 2:1-10. Julie Lyons was working as a crime reporter when she followed a hunch into the South Dallas ghetto. She wasn’t hunting drug dealers, but drug addicts who had been supernaturally healed of their addictions. Was there a church in the most violent part of the city that prayed for addicts and got results? At The Body of Christ Assembly, a rundown church on an out-of-the-way street, Lyons found the story she was looking for. The minister welcomed criminals, prostitutes, and street people–anyone who needed God. He prayed for the sick, the addicted, and the demon-possessed, and people were supernaturally healed. It’s all here in Holy Roller–the stories of people desperate for God’s help. And the actions of a God who doesn’t forget the people who need His power. So, check this book out! 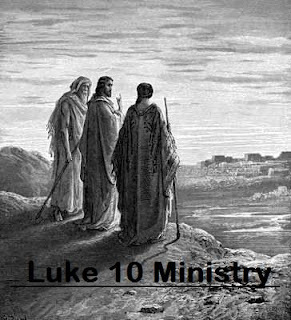 This summer we have been doing a Luke 10 Ministry. This ministry is a visitation ministry. We are seeking to visit shut-ins, the sick, and visitors to our church. The ministry is based off of Luke 10:1. Behind what we do is the idea that we are being sent out like the 72 disciples to places and people Jesus will soon visit. Here’s some more of my thinking on this passage of scripture. It occurs immediately after Jesus’ teachings on discipleship (9:57-62) and right before the parable of the Good Samaritan (10:25-37). What’s going on in this passage? I’m just looking at the first verse, but the story is that of Jesus sending out the 72 (some versions may read 70) to preach the kingdom of God. This first verse is interesting because it reveals the real purpose (their purpose was to preach the kingdom of God, but Jesus had something more in mind) as to why Jesus is sending them out. The end of verse 1 reads, “to every town and place where he (Jesus) was about to go.” Jesus is sending these 72 disciples out to not just preach the kingdom of God, but to prepare those they visit for Him. Why would they need prepared? Jesus reveals a radical picture of God. The Jews of His day were looking for a messiah that would free them from the Romans and restore Israel to what it was under King David. They wanted a warrior-king and a mighty kingdom to go along with it. Jesus’ kingdom differs from that. Jesus’ kingdom is like hidden treasure. It surprises you and causes you to want to sell everything you have to obtain it. The 72 sent ones are building anticipation and expectancy among those who will take time to listen to their message. Can you imagine how excited the 72 were to be sent out by Jesus with the message of the kingdom? What’s even better is that they knew Jesus would soon be visiting the exact same places they were just preaching at. Those who scoffed at them and doubted their message about this would-be king would no doubt be doing a double-take as Jesus strolled into their towns with crowds of people following Him. Wanting to go deeper in studying the New Testament has led me to a lot of the writings of New Testament scholar N.T. (Tom) Wright. There’s no doubt he is one of the brightest and best! I doubt I’ll ever be able to read everything he has written (just look at the list of his books on amazon.com), but that doesn’t mean I won’t try. The books I’ve read of his are excellent. When he is arguing something or trying to make a point he really covers all his bases well (he covers the arguments of his critics and even his critics’ critics down to the fourth generation, ha! This can make his writings a little dry at times). So if you are going to set out to read something by Wright be prepared for some serious discussion. I’ve been working my way through The Challenge of Jesus and have discovered that Tom is very helpful in getting me to see Jesus in his Jewish context. He does an incredible job of revealing what life was like for a Jew in the First Century. The Jews were who Jesus came to first minister the kingdom of God to. Because of this, Wright asserts that many of Jesus parables (e.g., parable of the prodigal son, the parable of the talents) are in some way or another referring to Israel. For example, we read the parable of the Prodigal Son and assume it is about God’s forgiveness and love for the lost. We assume the prodigal represents a lost sinner. Put on your Tom Wright glasses and you see that this parable is about God the Father waiting for Israel, the rebel son, who has run off and mingled with pagans (remember the son eating and working with pigs?) to return to Him. Now this parable is just as much about Israel (the real prodigal son) as it is about God and His forgiveness and love for the lost sinner. It becomes now about a group of people and not just an individual. The parables of the lost coin and sheep become about lost Israel and God’s intention and desire to see them found again too. So, why does this matter? Why is it important to place Jesus in His Jewish context? Well, for one it helps us see that Jesus was on a mission to seek and save lost Israel. Not saying He did not come to reveal the kingdom to us (Gentiles), but His first priority was to reveal Himself to Israel and be their King. Israel was really important to God. Israel really was His firstborn son. What God was attempting to do with Israel (Israel was to be a blessing to the other nations, see Gen 12:2-3) was important and mattered to God. He wasn’t about to throw them to the curb. Second, maybe we need to re-examine some of Jesus’ parables in light of all this. If most of Jesus’ parables were originally understood to be about Israel, we might need to revamp some of the application we draw from such parables (i.e. is the parable of talents/ten minas really about the judgment we will face if we do not use our gifts for God?). I’ve still got a lot more to learn and this post is just the beginning. Honestly, I'm still working on how much difference this understanding of certain parables of Jesus will make. We'll see. So, if you want to really get a good grip of the background to the New Testament and the context of Jesus I recommend reading N.T. Wright. Stan Toler was elected GS yesterday. Woke up this morning and found out that Dr. John Bowling (he was elected GS a couple days ago) rescinded. He woke up about 3am this morning and felt no peace about his decision. So, now the General Assembly is in the process again of electing a new GS. I told you this was a historic GA.
General Assembly is over for me and I’m headed home (with my dad). When all is said and done we will have traveled over 2,000 miles in a Chevy Impala. It was neat to be a part of the global NYI Convention and watch and observe the General Assembly. The COTN values people and you can tell that by the way we govern and do business. - Being in Global NYI Convention and having 9 other countries present via Skype. Delegates from these other countries could vote, ask questions, wave at us, talk to us, it was awesome! That was a job well done by the NYI tech crew. - The worship services were full of energy and encouraging. - Praying with other Nazarenes from around the world in small groups. - Seeing and hanging out with old friends (good to see ya again Jon!). - The service Friday night with Dr. Porter reinforcing the importance of discipleship and mentoring and that it must first start at home. - Taking communion with 22,000 Christians from all around the world. - Seeing how missional the Church of the Nazarene is and will continue to be. On a completely unrelated note, we ate at a little joint called Zaxby’s tonight after a quick run into the Bass Pro Shops. Zaxby’s is a chicken place. It was awesome! I gotta find one of these when I get back to Indiana. They have some finger-lickin sweet-and-spicy chicken wings. Just elected our third GS. Dr. David Graves. Here's a pic of him. The GS elections are now over. This GA was a historic moment for us in many ways. Exciting times!